Prologis customers joined members of the Prologis Czech and Slovak teams for a day of friendly but intense competition. Sixteen teams made up of 32 players again participated in the volleyball tournament, while guests and colleagues came along to cheer the teams on. During the games, participants and spectators relaxed on the terrace of the nearby restaurant Port62, soaking up the atmosphere and enjoying the gorgeous August weather. First place honours went to the team from Bonami, with a Prologis/Maurice Ward team coming in second and a team from EYELEVEL claiming third place. 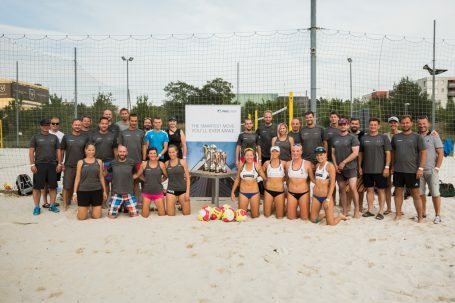 “We are delighted this fifth edition of the Prologis Beach Volleyball Cup managed yet again to bring together so many of our customers for a day of sport and fun — it’s such a good way to strengthen individual relationships as well as create new opportunities in a relaxed environment,” said Martin Polák, senior vice president, regional head, Prologis Central and Eastern Europe. Prologis is a leading provider of distribution facilities in the Czech Republic with more than one million square metres of logistics and industrial space (as of 30 June 2017).